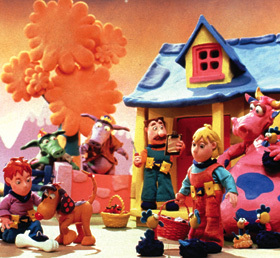 Astro Farm is a British claymation children's series aired on CiTV from 1991-1996. It was later rebroadcast on Nick Jr from 1999-2003 and on Nick Jr. Classics from 2004-2009, when the block stopped before it was rebranded to the logo used in the USA. The show revolves around a family who lives on asteroid farms. It follows their whimsical adventures as they grow, harvest and learns about their rather peculiar farm. A few episodes of the show have been released on VHS in the UK and are rather hard to find. A few episodes, as well as a promo featuring the show and Magic Adventures of Mumfie, were posted on YouTube in 2011, but have since been removed. All that remains up are two different coming up next bumpers from CiTV and Nick Jr, the last two minutes of the episode "Spooked! ", a CiTV "Later This Thursday" bumper that tells the plot of the episode "Crow Twins" that aired before an episode of Magic Adventures of Mumfie, a promo about Astro Farm and Mumfie, and a promo for CiTV shows sung to the tune of "Old McDonald Had A Farm", with Astro Farm as the main focus. A YouTube playlist of Astro farm episodes.